January and February are the months of cabin fever when I dream of the rainbow fields of the high country in summer, but "flowers" of another sort still bloom high in the Cascades. Born of eddies of the ice-laden gales, monochrome lilies of frost and powder carpet the slumbering meadows. Alpine firs, already twisted by the summer zephyrs, are rendered yet more Suessian by the drifts of winter. For those brave enough to venture into the howling winds and blowing snow, winter does hold its wonders. One of the easiest ways to experience the winter transformation is by snowshoe. 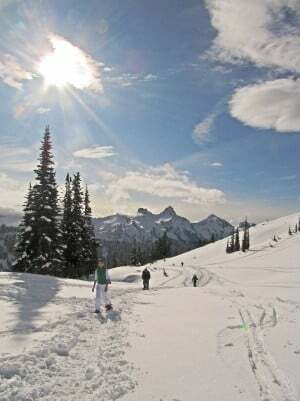 Paradise, one of the highest places you can drive to on the slopes of Mount Rainier, is one of the finest snowshoe destinations in the Pacific Northwest. No expensive chairlift ride or difficult on-foot ascent is required to reach the high meadows. Here are snowshoe trails, well-marked and packed to a nearly hikeable surface — a dozen or so miles are accessible right from the visitor center. 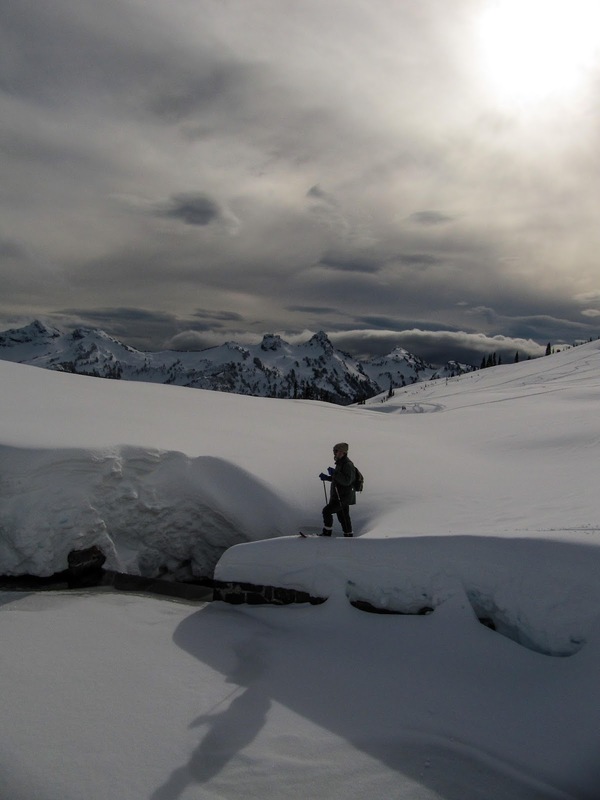 By no means is snowshoeing as easy as hiking, but it requires less equipment than skiing. 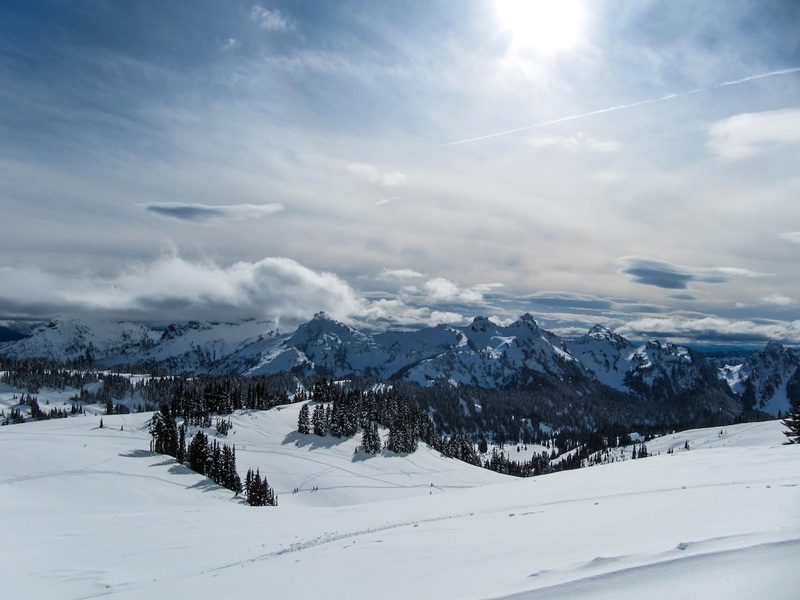 Because of the exertion involved, snowshoers may need fewer layers of warm clothing than is needed for most other winter sports, though it's still a good idea to be prepared for cold. One of the great advantages of the high country in winter is the freedom of navigation; some people like to snowshoe along packed trails, others prefer pristine powder. I prefer a bit of both — I walk along the trail and fall into powder to every side. You have to tell snowshoes who's boss — but I never did have an assertive personality. My snowshoes walk all over me and often take off down slopes on little adventures of their own. I have known the frustration of extricating my sorry self from the depths of tree-wells, but I have also experienced the rush of adrenaline that comes from sliding down a steep slope in the midst of a mini-avalanche. My snowshoes are of wood and rawhide, purchased several decades ago by my parents at an Navy surplus store in Alaska. Old-style snowshoes also have the bonus of functioning as skis for shushing downhill. 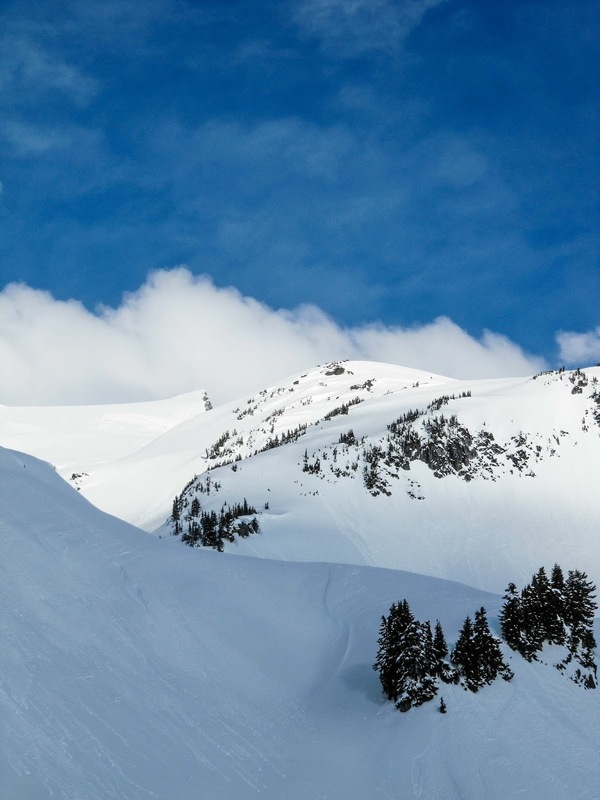 Modern snowshoes with all their fancy carbon fiber and aluminum are lighter and more compact , and their built-in crampons provide a far better grip in icy conditions. Most snowshoers use ski poles for better control, although I have a particular fondness for clawing my way up matterhorns on my hands and knees. For those lacking equipment, rentals of snowshoes are available in Longmire for $14.50 per day. Many winter-time visitors to Paradise go no farther than the designated sledding hill, and the rest of the crowd is dispersed over the array of trails. Most trails near the visitor center are marked and stamped down to a hard pack so novices should have no fear of losing themselves in the wilderness. However, one snowshoer was caught out overnight earlier this season — for those who are unsure of their abilities, there are ranger-guided snowshoe walks, which include free snowshoes for the duration of the walk. The walks cover about 1.5 miles, a decent distance by snowshoes. A ranger-interpreted view of the ecology of the park in winter is an added bonus. As you leave the bustling Paradise parking lot, you'll find weird clusters of snowy mounds dotted with little flags off to the side of the path. This is not a warren of giant snow dwelling prairie dogs; these are snow caves dug by winter campers. Winter camping is an option only for those with the equipment to do so. The gear is never cheap, and you may still be a soaking cold mess at the end of it. Nevertheless, there is a certain attraction to sleeping in a cozy snow cave, and it is the only time of the year camping is available at Paradise. If you do go remember that permits are required, group size is limited to 12 (except in the designated group snow camping areas), food must be carried in hardsided containers or hung from trees and all trash and waste must be carried out. Whatever you do at Mount Rainier or anywhere the snow falls thick upon the ground, stay safe — always tell someone where you are going, and don't travel out so far that you are too tired to make the return trip. Carry the essentials: a map and compass, food and clothing, a fire-starter, knife, a flashlight and space blanket. 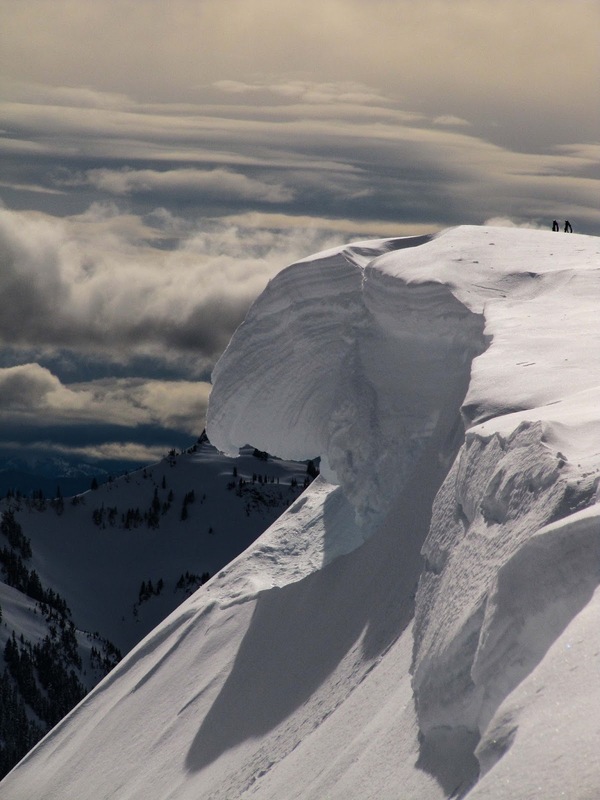 Check the weather; don't go if a storm's blowing in or if the avalanche danger is high. 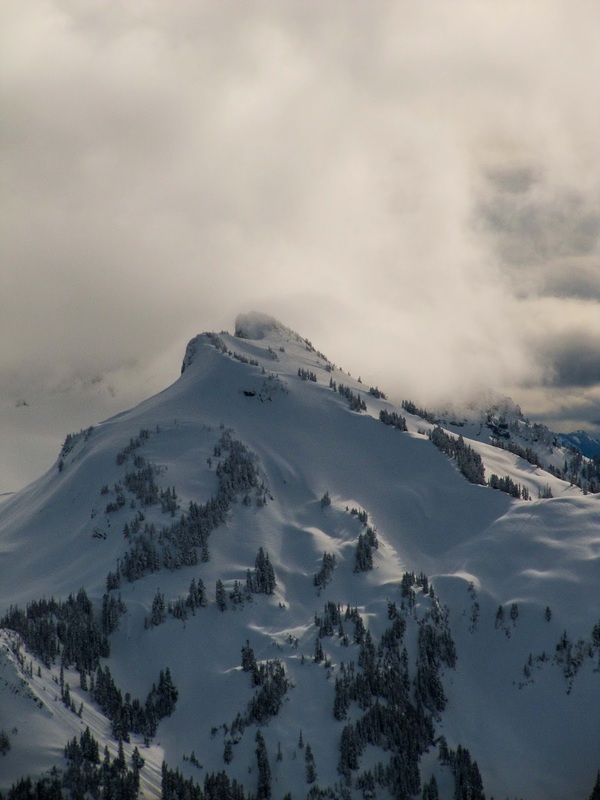 Remember that the weather at Paradise is not always predictable — even when most of the sky is blue it is wise to keep an eye on approaching clouds. After a trip in crisp mountain air, returning home, all soggy with sweat and melted snow, to a roaring fire (or whooshing heat-pump) and a warm house is the surest cure for cabin fever. You have smelled the scent of the ice flowers, and breathed the ether of the high country, and hopefully this will tide you over till the spring arrives.